In this wonderful old tv clip, the Delta Rhythm Boys tell us what happened to some famous walls. O Lord and Master of my life, give me not the spirit of laziness, despair, lust of power, and idle talk. But give rather the spirit of sobriety, humility, patience and love to your servant. Yes, O Lord and King, grant me to see my own transgressions and not to judge my brother, for blessed are you unto ages of ages. Now Isaac had returned from Beer-lahai-roi and was dwelling in the Negeb. And Isaac went out to meditate in the field toward evening. And he lifted up his eyes and saw, and behold, there were camels coming. 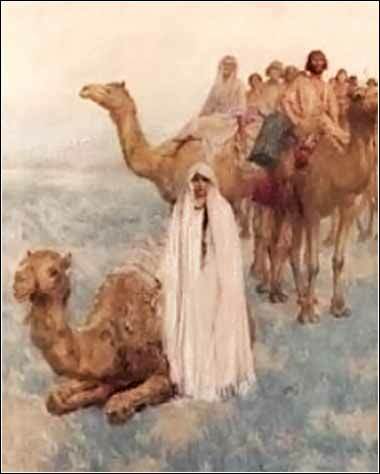 And Rebekah lifted up her eyes, and when she saw Isaac, she dismounted from the camel and said to the servant, "Who is that man, walking in the field to meet us?" The servant said, "It is my master." So she took her veil and covered herself. And the servant told Isaac all the things that he had done. Do you remember Beer-lahai-roi? It is the well in the northern Negeb Desert where God's angel led Hagar, when she was pregnant with Ishmael and was having one of her fights with Sarai. She had run away and was about to perish of thirst in the wilderness. We can only speculate that Isaac is living somewhere in the vicinity of Beersheba, possibly among the little band of Philistines whom Abraham had befriended much earlier in life. Again, the details have been lost in the annals of time, for this happened well over 3000 years ago. Isaac possibly has his own household; he would not have meditated somewhere he felt unsafe, so perhaps it was a field he owned, where he grazed his livestock. The meeting of Isaac and Rebekah is so romantic! He sees his lovely young bride, and she him, at a distance across a field; she is modest and covers her face, truly a "blushing bride". And then, without any recorded fanfare, he apparently marries her simply by the act of taking her into his tent, pretty much in the middle of nowhere. And . . . "he loved her". It is a happy ending to a happy story; Hollywood could not do any better.